It's "new" because I actually finished it 2 weeks ago but had been putting off photographing it. I'd been suffering from a case of Photo-phobia because my application to the very cool design site, trunkt, was recently rejected and I fear it's because of my photos. I also spent some quality time with the instruction manual for my digital camera and learned a lot about all those mysterious letters and numbers and white balance and such. So, I don't know if my photos are any better than they were but at least I feel more educated about the process! Do you have any photography tips or tutorials to share? Leave them in a comment and I'll try and do a follow-up post with your suggestions! While I'm a proponent of a white background (as all my pics will attest) I've always loved your darker backgrounds, too. The darker backgrounds give your bags a great context. I like your new white backgrounds, too, so I can see why you're in a quandry! We use a huge piece of white foam board for my product backgrounds, and really bright lights. I've always thought that your photos were great! I think your photos are great and so are your products. This just confirms my suspicions that I am really not ready to apply to Trunkt. I love the wallet pictured, btw. Thanks, Steph! Your product pics are beautiful-what kind of lighting do you use? what kind of sewing machine do you have??! I have a Viking 350 Sew Easy. It's 10 or 11 years old and my very good friend. I love the passport holder! It's the best one I've seen. Thanks for the photo tips. My house doesn't get alot of light for some reason and I've been to lazy to drag out a lamp to brighten things up. I would try to do it in Picassa and it just isn't the same. 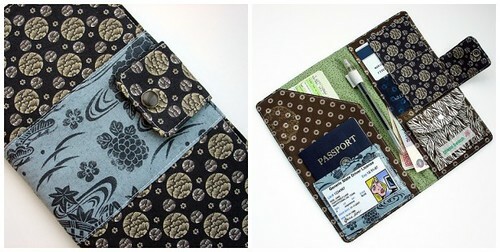 Love the fabric in the passport wallets! I wish you had these over the summer for my trip to Italy- my Target wallet just screamed "tourist!" Trunkt has no idea what they are missing out on. Although, I think the photography response may be a standard one. I know of several people (with good photography) that received the same response.